#freebooks – The Indian Fighter, by award winning author, Tim Robinson. Best Fiction, Florida Historical Society, Patrick D. Smith Award, 2018. 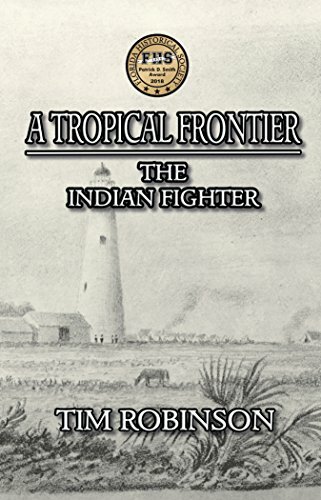 [Rating: PG-13] The Ninth novel in the “Tropical Frontier” series, The Indian Fighter is, in addition, the First novel in the “Indian Fighter” sub-series. In war people die, and they kill. The Second Seminole War would be the longest and most costly of all Indian conflicts in the United States in both lives and national treasure. In 1842, Colonel William J. Worth, commander of the Florida Campaign, declared hostilities at an end. Although as many as 3,000 Seminole and Miccosukee had been relocated to the Oklahoma Territory, several enclaves remained in the extreme southern portions of the peninsula at Big Cypress, Fisheating Creek, Catfish Lake, and New River. A census taken three years later accounted for 120 warriors, (70 Seminoles, 30 Miccosukee, 12 Creek, 4 Uchee, and 4 Choctaw), 100 women, and 140 children – a total of 360 souls. The Florida Indians had prevailed, and old Sam Jones would fulfill his vow to die in the land of his birth.